Its been a while since my last post. Actually I have to apologize cause I have been really busy with technical stuff. However, today I would like to write some lines about a recent outreach activity carried on the last Decemeber. It took place at the EOI Torrelavega*, the official state-funded language school where I have been enrolled these years. The school organised a speaking open day with multiple talks like the world-famous TED talks. The event was aimed to improve our communication skils in English, but there I had the chance to present the TRUSS project, the Horizon 2020 and the overall Marie Curie Action. 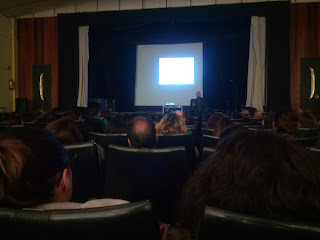 Heterogenous people from different classes and levels attended the talks making audience very diverse. From teenagers to old age pensioners, students, lecturers and profesors were all there. Herebelow it is a picture of the crowded function hall! My 10-minutes talk was useful even to me. Now I realize how little people know about the science behind the nuclear energy. Actually, some adolescents did not know about the number of nuclear power plants are located here in Spain. Then, it went kind of weird when some ‘a bit’ suspicious questions were raised about the radiation risk and the Fukushima faillure. My friends of ‘jovenesnucleares' still have much work to do! However, there are good news too. Most of the people were familiar with my host company here in Cantabria and they were pleased to know about the good research work conducted by ENSA.